Get valuable insights and learn best practices from our Wireless and Services Subject Matter Experts on designing, building, operating and maintaining broadband networks to speed time to market, improve quality and increase cost efficiencies. Your business is changing. You need to leverage digital technologies and cloud computing to stay relevant in your market. But as your applications move to the cloud, a whole new set of network requirements, focused on application performance, availability, agility and security, are created that you need to meet. Basically, this means you have to rethink your network design to better support your new cloud-centric environment. SD-WAN can help! Think of it as a unifying service that combines secure, agile connectivity with centralized policy management to address new, emerging enterprise requirements introduced as more applications migrate to the cloud. Directed at IT teams working in enterprises, local and state governments, utilities and universities evaluating or planning to deploy an SD-WAN, this webinar explores different use cases for which SD-WAN empowers enterprises to achieve their multi-cloud, digital transformation objectives. It gives you the understanding to evaluate how different managed SD-WAN service offerings fit with your cloud migration strategy. This is the second of a multi-part webinar series on SD-WAN presented by Ralph Santitoro, Head of SDN, NFV and SD-WAN Services at Fujitsu and Distinguished Fellow and Director of the MEF Forum. Part 1, Unravelling Managed SD-WAN Services, is available on-demand. Small cells improve a network’s coverage, capacity and quality of service at relatively low cost compared to macro cells. Wireless operators have historically used them to fill in coverage holes and supply extra capacity to high use areas. Recently, operators have started using small cells for large-scale network densification in their efforts to meet ever increasing mobile broadband demands and get ready for 5G. However, ramping deployments from 100’s to 1000’s of small cells can be tricky. There are many moving parts with lots of room for errors and delays that can break the business case. In this webinar, part 2 of a two part series, Gary Smith, one of Fujitsu’s most seasoned project manager, shares the top lessons we have learned in deploying small cells. Geared to those in wireless working in network planning, procurement, operations, construction and engineering, this webinar will provide you with valuable tips to make your small cell deployment successful. For other lessons learned, watch Small Cell Deployment: Lessons Learned Part 1 on-demand. You have done the research and definitely want to achieve the benefits of an SD-WAN. Not only will it improve the performance of applications through more efficient WAN bandwidth utilization, but also increase productivity and rev up the performance of your business. Building and managing your own SD-WAN is challenging. A managed SD-WAN service can help you immediately achieve SD-WAN benefits. However, not all SD-WAN services are created equal. How do you evaluate different SD-WAN services to select the one that optimally addresses your business objectives? Directed at IT teams working in enterprises, local and state governments, utilities and universities evaluating or planning to deploy an SD-WAN, this webinar focuses on baseline SD-WAN service capabilities and the role they play in the SD-WAN, giving you the understanding you need to best evaluate different managed SD-WAN service offerings. 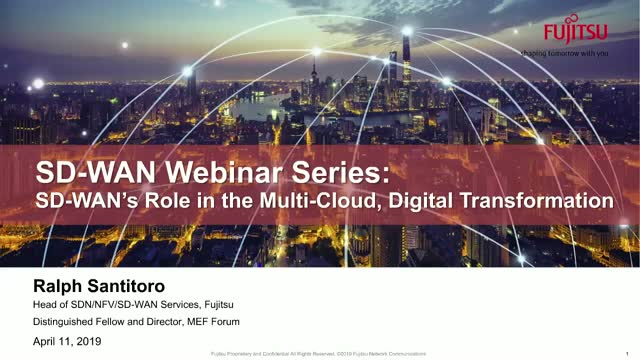 This is the first of a multi-part webinar series on SD-WAN presented by Ralph Santitoro, Head of SDN, NFV and SD-WAN Services at Fujitsu and Distinguished Fellow and Director at MEF Forum. However, ramping deployments from 100’s to 1000’s of small cells can be tricky. There are many moving parts with lots of room for errors and delays that can break the business case. Geared to those in wireless working in network planning, procurement, operations, construction and engineering, this webinar focuses on lessons we have learned on keeping small cell deployments high quality, on-time and on-budget. One of Fujitsu’s most seasoned small cell deployment project managers, Gary Smith, shares valuable tips on how to ensure your small cell deployments are successful.